In veterinary medicine we are a little more practical and since dental procedures on pets require anesthesia, we rarely do prophylactic dentistry on pets unless they have severe, chronic peridontal disease. Nonetheless, once your pet becomes middle aged and starts having tarter and gum inflammation, we recommend dental cleaning every 1-3 years as needed. It's important to the way your pet feels, it's important for mouth odor and it's important to over all health. Many terrible diseases ... kidney disease, heart disease, joint disease ... start with bacteria that entered the blood stream because of gum inflammation. You can stretch out the interval between dentistries under anesthesia, though, if you provide your pet with oral hygiene products at home. That's what this page is about. We now have polymer sealants for pet's teeth just like they do for humans ! A base coat is applied after professional cleaning and polishing under anesthesia and costs $25. As most of our clients already know, we recommend twice a year wellness exams for your pet and we do the mid year wellness exam for just $15. During these exams ... and any other time you bring your pet to us for a problem ... we take a close look at your pets gums, teeth, tongue, and throat ever vigilant for gingivitis, peridontal disease, tarter, ulcers, cancer, and abscess'. If your pet has oral hygiene issues, we'll point them out for you. If you're willing to train your pet into accepting a tooth brush ... not always easy ... no other method of oral hygiene works better. Don't use a toothpaste designed for humans It's fairly important to use a veterinary toothpaste. They're designed to be swallowed without causing stomach upset and the pet toothpastes have an acidity or pH that is compatable with cats and dogs. This is my favorite for most pets because it works almost as well as using tooth paste and a brush but it's a lot easier. Oral Gel is an antiseptic cleaner and excellent at dissolving plaque, destroying bad breath, and keeping gums healthy. No Brushing needed. But you have to apply it to the teeth and gums with either a squirt nozzle or your finger , so it still requires some effort and an agreeable pet. BioTene is an ointment used to apply to gum sores, ulcers, and to receded gums and pockets. The famous Hill's company has made a great prescription diet designed to remove tarter. The nuggets are full of floss like fibers. TD is low calorie and high fiber, so great for middle aged and older pets. TD is sold as a food, but we often recommend it as an inexpensive treat. With the exception of Tarter Control Treats (see below), I've stopped selling these expensive treats because I can't compete in price with pet stores who buy in much larger volumes. But they all help with dental health to varying degrees and most pets love them. Soup Bones: Offering your dog soup bones (no bones of the type likely to splinter such as rib bones or poultry bones) has some potential safety and cleanliness issues (greasy bones on your couch, for instance) but I must say that the dogs I see who regularly get to chew on bones tend to have beautiful teeth. 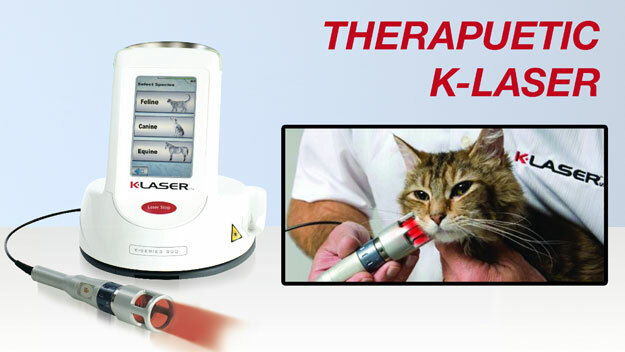 Laser Therapy: We now use the laser after most dental procedures to reduce post dental discomfort, kill germs, and speed gum healing.